"I am and always will be a Muslim. My religion is Islam." "I am not a racist in any form whatsoever. I don't believe in any form of discrimination or segregation. I believe in Islam. I am a Muslim and there is nothing wrong with being a Muslim, nothing wrong with the religion of Islam. It just teaches us to believe in Allah as the God. Those of you who are Christian probably believe in the same God, because I think you believe in the God Who created the universe. That's the One we believe in, the One Who created universe--the only difference being you call Him God and we call Him Allah. The Jews call Him Jehovah. If you could understand Hebrew, you would probably call Him Jehovah too. If you could understand Arabic, you would probably call Him Allah...."
Islam was not born in the 7th century A.D. Rather, it is the same religion that God revealed through His messengers (peace be upon them) to every people. Islam sometimes seems strange to non-Muslims because it is a religion which impacts every part of life, from eating and sleeping to working and playing. It is not only a personal religion, but also a social one. Muslims seek to live in accordance with God's laws. By doing so, they strive to obtain nearness to God and victory over temporary trials and temptations in this world. All aspects of their practice including prayer, fasting, charity, and pilgrimage are intended to help meet this goal. Although strict by secular standards, Islam is not an ascetic religion. Islam requires its followers to be active participants in their communities. Muslims believe that God is One, indivisible, and they believe in all the prophets of the Christians and Jews including Adam, Noah, Abraham, Ishmael, Isaac, Jacob, Joseph, Job, Moses, Aaron, David, Solomon, Elias, Jonah, John the Baptist, and Jesus (peace be upon them). Muslims also recognize another prophet named Muhammad (peace be upon him and his family), who is a direct descendant of Abraham through his first born son, Ishmael. His prophethood is prophesied in the Bible in several places, including Deut 18:18 and John 4:16. The Qur'an is the holy book of Muslims. It contains many stories that are familiar to Christians and Jews. It was not created by man but was revealed to the Prophet Muhammad (peace be upon him and his family) through the Angel Gabriel at the command of God. It contains no scientific fallacies or internal contradictions. In fact, it contains much scientific knowledge discovered by scientists only in this century. The Qur'an is an unparalleled Arabic literary masterpiece. Furthermore, it survives in its original revealed form, unlike the Torah and the Gospel. People living in the West and throughout the world should not allow themselves to be ignorant about Islam and Muslims. For example, there are six million Muslims living in the United States out of 1.2 billion in the world. Only 18% of Muslims live in the Arab world. Demographers say that Islam is the fastest growing religion in the U.S. (and the world) due to high birth rate, immigration, and high conversion rate. 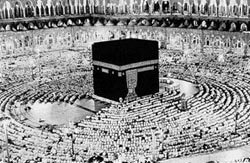 By the year 2000, Islam is predicted to be the second largest religion in America if it is not already, surpassing Judaism, Mormonism, Jehovah's Witness, and other religions. Salat is the name for the obligatory prayers which are performed five times a day, and are a direct link between the worshipper and God. There is no hierarchical authority in Islam, and no priests, so the prayers are led by a learned person who knows the Qur'an, chosen by the congregation. These five prayers contain verses from the Qur'an, and are said in Arabic, the language of the Revelation, but personal supplication can be offered in one's own language.